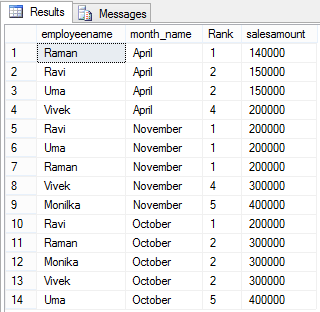 Ranking Function:- Sometimes we need to provide a Row number to the rows in a table or within a partition. For example, suppose we want to give rank to sales man according to their sales amount in a particular month/year. For this purpose, SQL server provides us Ranking functions. Ranking functions are used to provide a Rank to a row in a given partition. ROW_NUMBER():- This function gives the sequential number of a row within a partition of a resultset, starting from 1. If we see the result, we found that the function ROW_NUMBER() gives every row a number within a partition which is in case is month. If we see that result we found that RANK() function gives each rows a rank based on the sales amount value within a partition (in this month). Also we see that if more than one rows have the same sales amount then it gives same rank to all the rows containing the same sales amount value within a partition and for the next row it gives the next rank with a gap. For example in the above result, Vivek get the rank 4th in month April since it comes on 4th number instead of 3 and two rows in April with employees Ravi and Uma get the same rank. DENSE_RANK():- This function returns the rank of a row within a partition of a result set similarly to Rank function but it return the rank of a row without any gap. 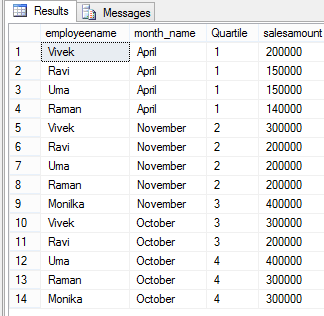 If we see the result , we found that Dense_Rank() function gives Rank without any gap as it gives 3rd rank to employee Vivek in month April. NTILE():- This function distributes the rows in an ordered partition into a specified number of groups. 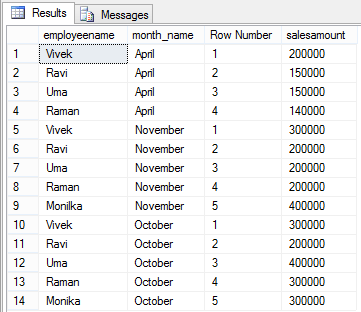 For each row, NTILE() will returns the number of the group to which the row belongs. If we see the result, we found that the Ntile() function divides the rows into 4 groups. Employees in the first group are given the rank 1 since they belong to first group. similarly are employees are given the rank according to the number of the group to which they belong. 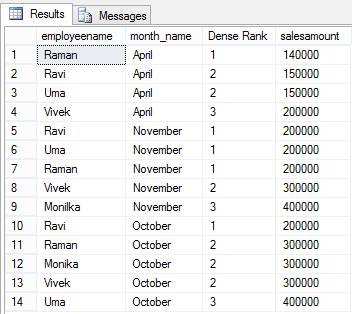 Summary :- In this article , I tried to explain the concepts of Ranking functions in SQL Server with the help of examples. We mostly used the functions Row_number() and Rank(). 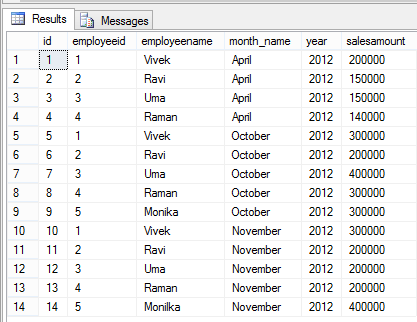 This function is also used in deleting the duplicate records in a table. I am waiting for your valuable comments (feedback) on this article. If you have any query regarding this, you can send me a mail at askvivekjohari@gmail.com.